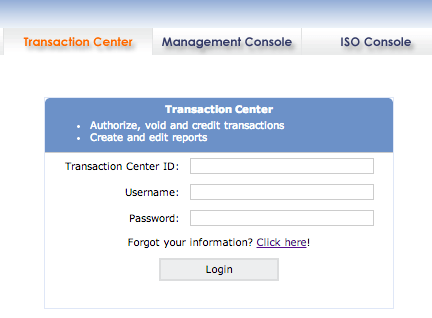 You may block an IP address for a particular customer in the Transaction Center if you wish. This can be useful if you suspect fraudulent charges coming from a specific IP address. Enter the IP address you wish to block. If you are only blocking a single address, the last text field can be left blank; if you are blocking a group of IP addresses, the second to last text field would specify what the start block address is and the last text field would specify the end block address. 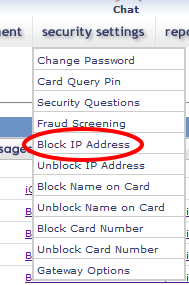 For example, if you wanted all addresses starting with 192.168.1 to be blocked you would set 192 - 168 - 1 - 1 - 254. See image below. NOTE: Verify the address before you block it. If you block an IP address and attempt to run transactions from that address, the system will give a Decline message. Leave the default search option of All IPs and click Search OR Select a Specific IP Address from the dropdown menu, enter the address to search for, and click Search. You will be presented with the IP(s) matching the search. You will be presented with a message that the addresses were unblocked successfully.